Music can make an ordinary video into something greater. Looking for free to use music in the classroom isn't easy. When I came across Bensound, and the close to 200 tracks that are availble for free download, it was a nice find I wanted to share. The music is instrumental and is separated in eight different categories. There is a preview feature for each selection and a download button for any you want to use. 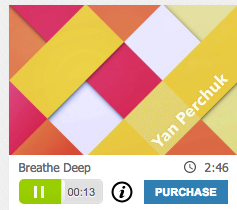 *Be mindful there are songs that are are not free but you will see "purchase" in place of the download button.